Omega Crowns Are Ordered By Case Numbers.Only the case number is going to get your crown. So open up the back case an look for the number on the inside of the case back. Once you have the case number you can check the page to see if we have your Omega Watch crown. At bottom of page is link to 18kt gold crowns. Shown on the page are the only Omega Crowns we are still able to supply. Crown 42147 and 42123 are listed for many of the same case numbers. The only thing different is the height of the crowns. Number 42147 is 4.50 mm in side wall height and 42123 is 4.0 mm in height. For model number 2598.20.00, 2598.80.00, 2599.80.00 and 2998.80.00, which use case number 178.0514. For Model number 2225.80.00 and 2925.80.91 using case case 178.0522. Also for case number 175.0514, 175.0518, Model 2594.52.00 178.0515, 178.0516, 178.0521, 178.0522, 178.0523, 178.0524. Overall height from top of crown to bottom of post is 7.10 mm. Fits current moon watch case number 145.0022 as well as case numbers 145.022, 145.023, 145.0023, 145.037, 145.0037, 145.0062, 145.0809, 176.009, 176.0009, 176.010, 176.0010, 178.002, 178.0002, 345.0808, 345.809, 345.0809, 345.808, 145.0818, 145.034, 145.0034, 145.031, 145.0031, 145.057. 145.0057, 145.062, 145.0222, 145.0022, 2965, 145.0304, 145.0305, 145.060, 145.0060. Model numbers 3570.50.00, 3597.11.00, 3594.50.00, 3870.50.31, 3590.50.00 and others use case 145.0022. Model number 3565.80.00 case number 145.0229 takes this crown 43069 #8100/1592W. For case number 145.012SP use this crown Omega 43069, while if you have case 145.012 without the SP, then use Omega crown 43018 number 8100/1095. Omega crown 42005 replaced by 42054, 42029 replaced by 42054, 42040, 42042 replaced by 42054. This is a 4.75 mm diameter crown, tube opening 2.0 mm, tap diameter 0.90 mm. 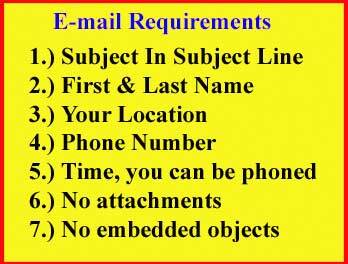 CASE # :2438, 2478, 2991, 14384, 14392, 14700, 14701, 14704, 14710 14733, 14746, 135.011, 135.011SP,135.012, 135.041, 135.042, 135.070, 136.011, 136.011SP, 136.012. 136.012SP, 136.041, 164.012, 165.012, 165.013, 165.015, 165.070, 165.009, 166.009, 166.012, 166.013, 166.017, 166.018, 166.041, 166.054, 166.055, 166.055, 166.056, 166.063, 166.070, 166.075, 166.101, 166.0252, 166.0253, 167.021, 168.007, 168.008, 168.009, 168.017, 168.018, 168.019, 168.027, 168.029, 168.042, 168.045, 168.046, 168.048, 168.050, 366.857, 366.0859 and many more. Crowns numbers 42004, 42010 replaced by 42055, which is 5.0 diameter with tube opening of 2.0 mm for a tap 10 stem. In 1988 the Omega cross reference number was 42010 for this genuine Omega crown. Today 2003 Omega says that crown 42010 is no longer and is equal to 42055, which is 8100/1664. Case 14381 see also crown 8100/1134. Bestfit list case number 14381 to take crown 8100/1080 only in the Bestfit Books I & II. All other list produced by Bestfit list case 14381 to take the Omega "Hermetic" crown bestfit number 8100/1134. case 165.024 used two crowns. This crown is 6.7 mm in diameter and 3.15 in height. The other crown used is 8100/1144 and is 6.5 mm in diameter and 5 mm in height. CASE # :2300, 2327, 2328, 2374, 2375, 2420, 2421, 2472, 2474, 6028, 6040. Diameter 5.40, tube opening 2.0 mm, tap 10 (0.90 mm). CASE # :2450, 2639, 2640, 2647, 2679, 2680, 2690, 2691, 2721. Diameter 5.40 mm, tube opening 2.50 mm, tap 7. 6.75 mm diameter, 3.34 mm thick, 2.5 mm opening for tap 7 size stem. Satin Finish, does not have Omega Logo. Fit case 2777 & others. Listed as crown for case 2777 in data provided by Bestfit, however in the Bestfit Books crown 8100/1076 is listed as the crown for case 2777. We know that some of the information in the Bestfit Books in wrong while we also know that sometimes some of the information Bestfit has supplied in listed over the years is wrong where the conficting information in the Bestfit Book has once in a while been right. 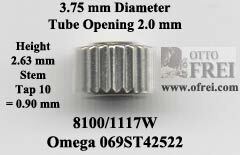 Listed in Bestfit Book with Tube Opening 2.25 mm, Crown Diameter 6.10 for Stem Thread 1.20 mm. Anyway the people that made all these books and list for Bestfit from 1940 to 1980 are all dead and we can't ask them, so we make do during the best we can. The people at Omega who new these things are also hard to find as well these days. Flightmaster also takes two other crowns number 43066 with stem and blue dot on top and crown number 45012 with black dot on top. Crown 8100/1194W Omega 43048 fits the old version of case and 8100/1220W Omega 43068 fits the new version of the cases listed. Today Omega list old 43048 and new 43068 as being replaced by the crown 42524. The terms old and new are used in the 1972 B. Jadow listing of Omega crowns. Crown 8100/1194W Omega 43048 fits the old version of case and 8100/1220W Omega 43068 fits the new version of the case. Today Omega list old 43048 and new 43068 as being replaced by the crown 42524. The terms old and new are used in the 1972 B. Jadow listing of Omega crowns. Fits case numbers: 166.1050, 166.1109, 268.1050, 168.1050, 566.1050. Flightmaster also takes two other crowns number 8100/1149 and crown number 43066 with stem and blue dot on top. Two pushers that have yellow and red dots are also used on the Flightmaster. One of two female post crowns listed for these case number: 135.033, 136.033, 165.039 and 166.039. 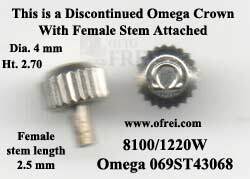 Use with Genuine Omega crowns in genuine Omega two-piece stems cases. Fits case number, 196.0185, 196.0209, 196.185, 196.229, 196.0229, 196.0230, 196.230, 196.0234, 196.234, 196.0252. 196.252, 396.0900, 396.0905, 396.0913, 596.0043, 596.043, 796.0838. Case numbers 196.252. 196.0252, 196.286, 196.0286. Crown 8100/1194Y Omega 43048 fits the old version of case and 8100/1220Y Omega 43068 fits the new version of the cases listed. Today Omega list old 43048 and new 43068 as being replaced by the crown 42524. The terms old and new are used in the 1972 B. Jadow listing of Omega crowns. Case number 105.003 and 145.012 are both also one of those cases with more than one crown. On certain list Crown 8100/1077 is listed and on other list it show this crown 8100/1095 is listed for the 105.003. 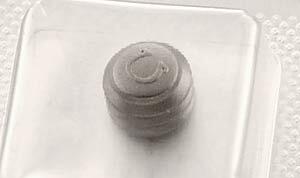 For the 145.012 it is also listed as 8100/1074 on some list, which is a 6.0 mm diameter crown 3.0 mm in height. Stainless Steel, for case number 396.1041, 396.1042, 396.1042/3, 396.1042/4. For case numbers: 168.1501 steel case cal 1111, 168.1501005 steel case cal 1120 Jacques Mayol, 168.1502 steel case cal 1109, 168.1503 steel case cal 1111, 168.1504 steel case cal 1109, 168.1505, 168.1601 steel case cal 1120, 168.1602 steel case cal 1120, 168.1603 steel case cal 1120, 168.1612 steel case cal 1120, 168.1622 steel case cal 1120, 168.1623 steel case cal 1120, 196.1501 steel case cal 1438, 196.1502 steel case cal 1438, 196.1503 steel case cal 1438, 196.1506, 196.1516 steel case cal 1400, 196.1522 steel case cal 1538, 196.1523 steel case cal 1538, 196.1526 steel case cal 1400, 196.1536 steel case cal 1400, 268.1501 steel gold case cal 1111, 368.1502 steel case cal 1111, 368.1503 steel case cal 1111, 396.1502. 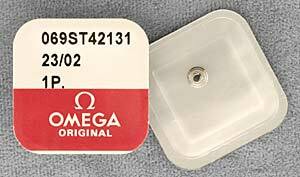 Omega crown number 42034, 42035, 43041 are now replaced by 42531. Diameter 6.0 mm, height 3.0 mm Omega crown 43008 CASE # :2077, 2287, 2451, 2884, 2885, 2886, 2907, 2947, 14364, 14904, 105.001, 105.004, 105.005, 14360, 14364, 145.005. For 145.012 145.0012 a second larger crown is also listed on some list it is the number 8100/1095W and is 6.7 mm in diameter and 3.7 mm in height. Flightmaster also takes two other crowns number 8100/1149 and crown number 45012 with black dot on top. Two pushers that have yellow and red dots are also used on the Flightmaster. Screwdown crown for Case numbers 198.016, 198.0016, 198.005 198.0005 and for 176.004, 176.0004, 198.036, 198.054, 198.058, 166.0137. Outside diameter measures 6.23 mm; Inside diameter measures 3.10 mm; and height measures 5.55 mm. Waterproof and "Hermetic" is an Omega factory designation for a "Sealed" Crown. "Hermetic" is usually associated with Dustproof type crowns. Omega Hermetic crowns look like waterproof and for this reason Bestfit list the same Hermetic crown in both the Waterproof and Dustproof section. Please see the note on the bottom of page your 795 in the bestfit catalog. Diameter 5.40 mm, tube opening 2.50 mm, tap 10. In 1988 the Omega cross reference number was ST42050 for this genuine Omega crown. 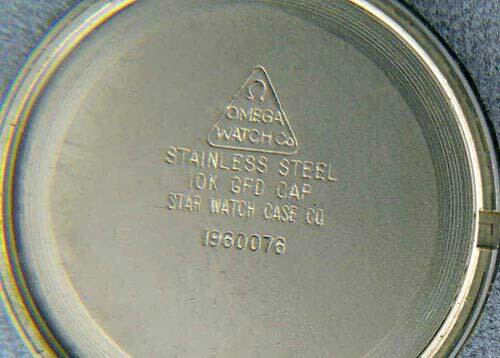 Today in the year 2007 Omega says that crown LA42050 is no longer and is equal to SX42522. Omega crown 42005 use 42054, 42029, 42040, 42042 use 42054 and now 42054 is discontinued and Omega says to use 42529. This is a 4.75 mm diameter crown, tube opening 2.0 mm, tap diameter 0.90 mm. CASE # :136018, 136018 OLD, 165026, 165023SP, 166035 OLD, 166036, 166050, 166049 OLD. Now use crown 8100/1501Y, which is supplied a separate threaded Female Crown Post than you then cut to the desired length. Vintage Genuine Omega Crown Yellow Female 3.75 Dia. Vintage Genuine Omega Crown Yellow Female 4.5 Dia. Vintage Genuine Omega Crown Yellow Dustproof 3.5 mm Dia., 4.90 Ht. 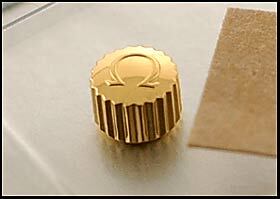 Genuine Omega Crown Yellow Dustproof 3.6 mm Dia. Omega Crowns "Pink" Rose Gold "In Stock"
In 1988 the Omega cross reference number was ST42050 for this genuine Omega crown. 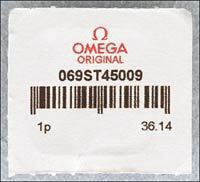 Today in the year 2007 Omega says that crown ST42050 is no longer and is equal to ST42522.